Benue State chapter of Peoples Democratic Party (PDP) has found itself in a quagmire over the conduct of Ogbadibo State Constituency, in which a female aspirant, Aida-Nath Ogwuche, is accusing the winner, Mr. Peter Enemari, of intimidating her supporters and levying violence on her. Ogwuche told The Guardian that when it became apparent that every aspirant was reaching out to the delegates with money, she decided to also give her supporters N110, 000 each. However, she said that when it became obvious that she was coasting home to victory some of the aspirants stepped down, only for some political thugs believed to be working for Enemari to attack her, injuring in her in the process. She added that in a surprising move, the police that took her to the hospital from the stadium venue of the primary, failed to make arrests despite the fact that she made an official report of the attack. However, Enemari, who was returned as winner of the primary, stated that there was no violence or untoward incidence at the venue of the primary, stressing that Ogwuche started making trouble when she discovered that some of the delegates she induced with money did not vote for her. Party stalwarts disclosed that there was a zoning arrangement for Ogbadibo State Constituency, noting that Ogwuche, who had been resident in the United Kingdom, returned to contest the assembly seat even when it was not the turn of her ward. Ogbadibo State Constituency has always been a subject of stiff contest between the constituent wards, based on its strategic position in determining the outcome of governorship polls in the state. Ogbadibo Local Government Council is made up of three major districts, namely Otukpa, Orokam and Owukpa. It has a total of 13 council wards with Otukpa having six wards, Orokam three and Owukpa four wards. These three districts have often rotated the Ogbadibo State Constituency seat amongst themselves. For instance in 1979, the incumbent Minister of Agriculture and Rural Development, Chief Audu Ogbe, occupied the seat. He is from (Ai-Oono Ward 2 in Otukpa). In 1983, it was Christopher Ajunwa of Olachagbaha Ward in Otukpa, just as in 1999 it was Mr. Edoka Nnaji of Ai-Oodo Ward 2, who emerged from the election as the constituency’s representative. It is therefore obvious that the seat has rotated among Ai-Oono, Olachagbaha and Ai-oodo. Consequently, the popular notion is that it should be the turn of Ai-Oono, which has two more wards that has never occupied the position since 1982. It was on that basis that the seat was unanimously zoned to Ai-oono Ward 3, and as such most stakeholders from the area saw the entry of Aida-Nath into the race against the long-existing arrangement as an attempt to infringe on the power sharing balance in Otukpa. It was therefore in realization of that arrangement that six other aspirants from Ai-oodo area, including Ebije Benjamin, Andrew Idoko, Gabriel Ameh and Ehikowoicho, all of Ai-oodo Ward 2; Emmanuel Abba and Onoja Umoru, both from Ai-oodo ward 1 all stepped down for Enemari the moment the position was zoned to Ai-oono, leaving only Aida-Nath in the race with the candidate from the area to which stakeholders traditionally zoned the seat. Prior to the September 29, 2018 primary election in Ogbadibo State Constituency, nine aspirants were in the race, but they all bowed to the zoning arrangement that had long been in existence in the constituency since the return of democracy in 1999, with six aspirants from the wards that had taken their turns all stepping down for Enemari from Aiono ward III, whose ward and district was expected to produce a legislator in Benue State House of Assembly for the next dispensation (2019 to 2023). Although some of those who supported Ogwuche said the constituency was crying for a change, it was gathered that the zoning format boosted Enemari’s chances, even as most youths, delegates and stakeholders rallied round him to victory. However, those who wanted to alter the status quo, particularly the only female aspirant, Ogwuche, went into the race in the belief that delegates could be swayed to vote for her based on her personal qualities, not minding that she hails from Aiodo ward 1 that had the last turn of the zoning in Otukpa. Despite cash incentive to some delegates, after the collation and counting of votes cast at the poll, the total came to 136 votes. While Peter Patrick Enemari polled 79 votes, Aida Nat scored 52 votes to emerge the first runner-up. Sources alleged that perhaps out of desperation, Aida-Nath had after conclusion of voting threatened a former Local Government leader, (name withheld) that he will pay with his blood for not voting for her as she had suspected. It was also gathered that her agent, Adaolowu who witnessed the vote counting and signed the result had threatened the agent of the winner, Peter Enemari openly. Adaolowu said denied ever threatening anyone, saying that the leader threatened supporters of Aida that if they voted for her he would remove them from their positions in the party.A delegate, Mr. Shuaibu Ijika, who was allegedly used by Ogwuche to lure other delegates with the sum of N110, 000 reportedly recovered same amount from Hon. Bernard Agada, popularly called Ichoja, Ai-Oono Ward 1 chairman, as he and other delegates were on their way out after result was announced with her loosing out. “It was the attempt to ambush other delegates that collected money but allegedly failed to vote for Ogwuche that led to an altercation and delegates scampered out of the stadium out of fear,” a PDP stalwart confided in The Guardian. One of the super-delegates, PDP Woman leader, Hon. Eloyi Onekele, Ogbadibo Local Government Area, repudiated Ogwuche’s claims that the delegates’ list was falsified, saying: “How can she claim that a fake delegate list was used for the election whereas it was the same delegates’ list that Ogwuche claimed was not authentic that was also used for governorship, Senate and House of Representatives primary elections? Faulting Ogwuche’s claims, a senatorial aspirant, Mr. Joseph Ojobo, who hails from Ogbadibo Local Government, confirmed that it was the same list that was used simultaneously for both elections in the same venue and date. Meanwhile, Ogwuche, who is the first runner-up in the State Assembly primary, stormed PDP national headquarters in Abuja. While speaking with reporters, the U.K. based lawyer, expressed disappointment with the entire electioneering process, contending that the primary was marred by irregularities, including intimidation and violence. She alleged that from the build-up to the primaries, the process witnessed a lot of intimidation and harassment of supporters and delegates that should have voted for her after attempts to force her to step down for her opponent failed. Alleging that some of her supporters could not find their names on the delegates’ list, she declared: “Before we went into the stadium, my agent, my coordinators and some key persons in my campaign had been threatened. Some thugs were looking for my agent (Lawani) and some other boys walked straight to the vice chairman of my ward and the women leader and told them that they would chop-off their fingers if they voted for me. They were threatened right there outside the stadium when they were on queue. “One of the boys came to someone while I was standing by and didn’t know I was the aspirant, and mentioned a name (which I will withhold for now) as the leader of their group and said that he sent him to give a resounding warning to my coordinator, and I began to fear for my life and everything. The issue of internal democracy and free and transparent election has continued to occupy public discourse in the country, especially given the discordant tones over the primary season among political parties. 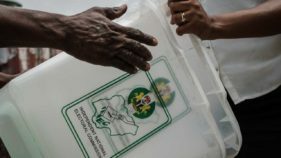 As a sign that the issue is central to the conduct of next year’s general election, the European Centre for Electoral Support (ECES) stated that it was partnering with Independent National Electoral Commission (INEC) to conduct free and transparent elections in the country in 2019 and beyond. The project coordinator for ECES in Nigeria, Mr. Rudolf Elbling, who stated this during a capacity building workshop the centre organised for INEC staff, pledged ECES’ continuing support to the electoral body in capacity building, technical assistance, specialized trainings, engagement with stakeholders, voter education and sensitization.